Emerson post-War midget in beautiful red Plaskon case. 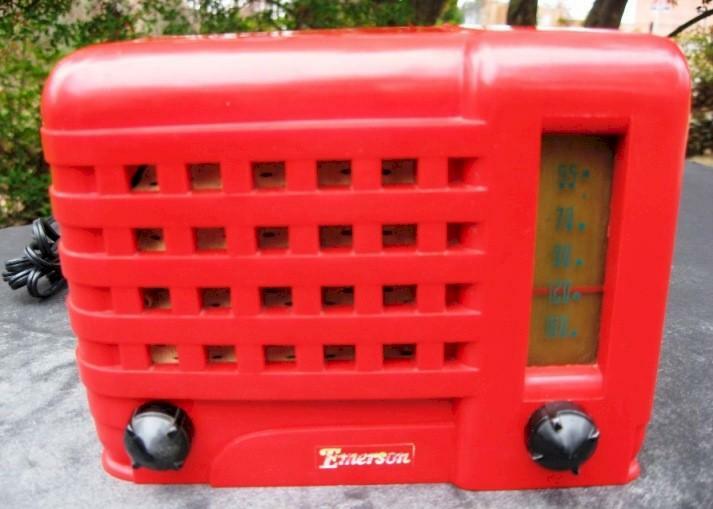 This is not a painted radio, it is a solid red Plaskon case. This fire engine Plaskon red color and the Plaskon mint green color are very hard to find. This case is in excellent cosmetic condition. No cosmetic issues on the top, front, right or left sides. No chips, two tight hairlines (1/4") on the back bottom corners, and a tight 3" hairline also on the bottom, along with a scratch. Unless you plan on displaying the radio upside down, these really aren't issues. The midget knobs are original, as well as the back & the grille cloth. The radio has been recapped and is playing fine, better with a little antenna wire added. Here is a description from a 1947 ad for the radio: "Emerson Radio Model 540. World's Smallest AC-DC Superheterodyne. Size 4.75"H x 3.25"D x 6.5"W. Alnico 5 Permanent Magnetic Dynamic Speaker, Built-In Super Loop, Automatic Volume Control, Many Other Advance 'Big-Set' Features. Choice of Four Colors-Walnut/Ivory/Red and Green." You are visitor number 2,380 to this page.